The Netgear Nighthawk Pro Gaming XR500 Router delivers very competitive range and speed, as well as excellent file transfer performance and a suitably futuristic design that comes stacked with connections, too. This router is not just a hardware powerhouse though, with its unique DumaOS interface allowing gamers to quickly and simply tweak every aspect of their connection to stabilise ping, reduce lag, and even ensure quality local connections. Simply put, it's the best router on the market today for gamers. If you want an immediate take-away from this review then this is it: the Netgear Nighthawk Pro Gaming XR500 is the best router in the world for gamers. If you are a serious gamer, in need of a performance router, and you've got the cash to ring it up, then you should simply go out and buy the XR500. 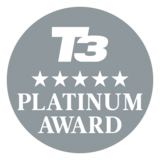 The Nighthawk achieves this through a superb combination of high-end router hardware and, even more importantly, an incredibly powerful and easy to use user interface that allows for simply insane levels of customisation, monitoring and connection management. The result is a router that will almost certainly reduce lag and stabilise ping for its user while gaming, be that through a current generation console like the Xbox One X, or via PC. It is also a router that is more than capable of sitting right at the heart of a home network, too, with absolutely zero barrier in terms of setup ease and operation, as well as monitoring and management. Yes, you can get similar performance in terms of range and speed from some other, less expensive routers, but to gamers its gaming-specific features and software really do make it the best-in-class proposition. Yes, the XR500 looks like a star fighter from a '90s shmup, and as such looks incredibly cool. Take the XR500 out of the box and the first thing you notice is its super low profile and futuristic design. Antennas removed, which is how this Nighthawk comes initially, the router measures in at just 2.2-inches in height. 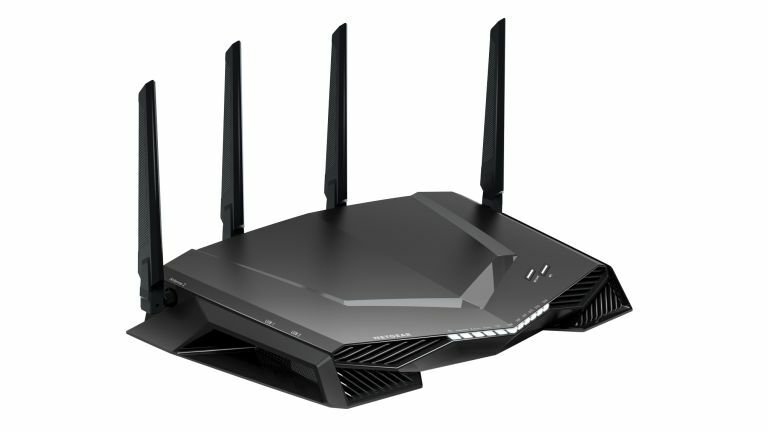 It looks like a star fighter from one of the shooters you played in the 1990s, with a series of sharp angles and jagged vents communicating very clearly that this is not normal router. The Pro Gaming's antennas come bagged separately and thumb-screw on to the chassis, with two attached to the rear and one on each side. Thanks to rotational capability around the connection points, and a hinge at the base of each antenna, if you had limited vertical clearance around router then these can be folded in quite compactly, however, the optimal orientation for range and speed is shown in the above image. In terms of lighting and connection layout, you get a V-shaped array of rectangular LED's on the front which detail activity on both the 2.4GHz and 5GHz bands, guest Wi-Fi, general internet availability, as well presence of physical connections, while on the top of the router you get a brace of buttons to turn Wi-Fi on and off, as well as to initiate a WPS connection. The rear of the XR500 sports an array of easily accessible cable ports and a switch to turn off its LED lights if desired. Move around the back of the Netgear Nighthhawk Pro Gaming XR500 Router and, before you get there, you find a brace of USB 3.0 ports tucked into a recess. These connections make sharing files, or backing them up once shared via Netgear's included ReadySHARE Vault application, straightforward and as the USB ports are not buried on the rear swapping storage in and out is easy. At the back you find a clean and simple selection of ports, switches and buttons. DC in and the router's power button are followed by an uplink and four Gigabit LAN ports. A reset hole and switch to kill all LED light activity complete the package. The XR500 is powered by a rapid Dual-Core 1.7GHz processor. Installation of the XR500 was very straightforward, with the total time from me getting it out of the box in my house to the router being up and running just over 10 minutes, and I was into the router's DumaOS user interface and tinkering within 15. And, with the Nighthawk XR500 set up and connected to my Xbox One X, PS4 Pro, PC, and Samsung 4K HDR Smart TV, as well as connected to the myriad of other Wi-Fi-enabled hardware around my house (both directly and via a Negear EX8000 extender) I am happy to report that I was very impressed with the XR500's hardware performance. As I live in Bath, England, a city that has a very unique heritage in terms of what buildings are constructed from (they are all built largely from "Bath Stone" to maintain its Georgian aesthetic), range and connection quality has always been a big challenge for me, especially when factoring in rooms on the second floor or in the attic. With the XR500 though I really had no issue making the most of my 235MB down Virgin media connection, with download speeds remarkably fast and stable (downloading the Fifa 18 6.2GB World Cup update took a matter of minutes), online gaming sessions an uninterrupted joy, and file transfer from one device to another incredibly fast (especially over an un-interrupted short range). The 2.6Gbps Wi-Fi capabilities of this router are el fuego! What really impressed me most though, and to be honest surprised me a little as well, was the XR500's 2.4GHz performance over the medium to long range. I was capable of connecting to the Nighthawk from a PS4 Slim in my study on the second floor of my house, which is on the opposite side and also through a thick stone wall and multiple cavities, and still retain a solid connection and a third of close range speed. What's more, when I routed the XR500 through the EX8000 extender (look out for a separate review on this soon), I could carry this range and speed quality into my attic, which is laid out as a games room filled with a PS3, Xbox 360 and another gaming PC, as well as a selection of other Wi-Fi-enabled tech (as you can tell, I am a pretty serious gamer). From my testing period I noticed that the 5GHz connection seemed to be not as strong as the 2.4GHz in terms of performance over the medium to long range, however, when compared to the older dual-band Netgear router I was using before it the XR500 absolutely smoked it in terms of both speed and range across both bands. Simply put, in terms of hardware the XR500 is right up there at the top end of the performance charts - however, for me that is only one part of why this router scores so well. The DumaOS allows you to prioritise gaming devices by allocating bandwidth to them via a simple 0-100 numerical score. And that's because the real star of the XR500 package is its build-in DumaOS user interface which, with me unable to avoid the official sale tag, really is "the router software of the future". Netgear has smartly partnered with NetDuma here to bring the state-of-the-art OS to the XR500 hardware and the results are simply spectacular. Through the DumaOS, which simply requires you to visit www.routerlogin.net on your home network and sign in with a username and password, a process that takes 10 seconds, you get granted access to analytics and tools that are not only incredibly comprehensive, but also directly geared toward gaming and incredibly easy to use. A myriad of monitoring data and analytics are at your fingertips through the XR500's DumaOS. Gone are the days of a jumble of technical jargon and an assault of numbers and menus on a stark white background, and in is a user interface that displays information about the router, your home network, and game-related data in a clear series of understandable and easily tweakable visuals and options. For example, through the DumaOS you can access and manage its in-built Geo Filter, which is displayed - as makes perfect sense when you think about it - via a map of the world, and by simply creating profiles for hardware or specific titles you can fix gaming lag issues by limiting distance to certain servers or other players. Selecting the distance, creating blacklists or whitelists, setting profiles and more is all achieved via a few button clicks or slider drags. The XR500's DumaOS's Geo Filter helps you get a guaranteed quality, local connection. Elsewhere, you can prioritise gaming devices by allocating to them a proportion of your overall bandwidth though the DumaOS's Bandwidth Allocation menu. This is a particularly helpful tool if you run a crowded network, with multiple family members heavily eating in to your bandwidth, or if you tend to suffer peak time drops from your provider, meaning that you can effectively lock down the bandwidth necessary for you to maintain a stable, high-quality gaming connection no matter what else happens. And, again, the DumaOS makes dishing out this bandwidth allocation (both download and upload as you wish) incredibly simple. Each device on your network is listed on coloured wheel and by selecting its bubble and dragging it from the centre to the extremity, you can assign a percentage of your bandwidth just to that (from 0-100). So, for example, if you know that your partner is going to be streaming 4K HDR movies imminently, then you can make sure your gaming device of choice has a bandwidth safety buffer beforehand. An easy to analyse network map in DumaOS showing all connected devices, both online and offline. DumaOS also lets you keep an eye on real-time bandwidth utilisation with its Internet Utilisation Monitor, again with information displayed via coloured pie-charts and bar graphs. This quickly and simply lets you see which devices are hoovering up all your bandwidth and, as a result, Sherlock Holmes which one may be causing lag or slowing down your online game. Throw in the fact that you can also personalise your own XR500 dashboard in DumaOS to get your most used or usable data and parameters on a single screen, with no menu diving necessary, and you can start to see just how game-changing and highly useable this software is. It really helps elevate the overall networking experience and, in a perfect fit for the Nighthawk XR500, does so with a gaming focus. The XR500 supports MU-MIMO Wi-Fi streaming and beamforming technology. I hope it is obvious from this review that I really rate the Nighthawk Pro Gaming XR500 Router. And, while this definitely is because of its top-end hardware and performance, as well as its futuristic design (I'm still a boy at heart), the real X-factor is the router's super powerful and gamer-friendly DumaOS user interface, which I feel really does add an unprecedented level of connection control and management for those who are not networking maestros. The fact that I had the XR500 set up within 10 minutes and was then exploring and tweaking various things through DumaOS with 15, with no issues or WTF moments, really speaks to the quality package the Nighthawk Pro Gaming delivers and, simply put, it really is most welcome. Would I buy the XR500? Well, as a writer probably not due to its undeniably high price, however, from a technical point of view I really can't knock it and if you can ring it up then it is incredibly easy to recommend if you are currently in the market for a high-class gaming router. For more information about the Netgear Nighthawk Pro Gaming XR500 Router then visit its official web page.